Get the tutorial here to make your very own fabric bracelets. I promise to be back blogging soon, and have some great new projects coming your way. I just need to get over this flu I got somehow that has been haunting me since Sunday. Oh I hope I feel better soon, I need some playtime with my little girl. I hope you all have a wonderful weekend. VERY cute!!! Feel better soon. What a cutie with those bracelets! I hope you are feeling better soon too! She could not be any sweeter, feel better soon! Sooooo girlie!!! Hope you're feeling better soon. Feel better. 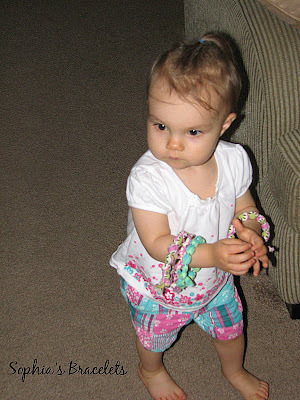 Your girly girl and her bracelets are adorable! so cute...they always do that don't they? Camera comes out & wham! they change what they were doing in that made us go get the camera.